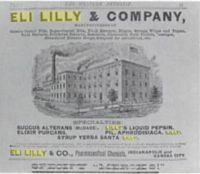 1886 Eli Lilly newspaper advertisement. In part one of this blog, I discussed the beginning of my loss of faith in research, particularly psychological research. As I noted, I began my career interested in being a researcher. I conducted a number of studies, some of which I never sought publication for because of my own loss of faith in research. In part one, I focused a good deal on the limitations of quantitative research that I learned experientially. In particular, I discussed how there was much more subjectivity in research than what is often acknowledged. In this part, I will focus more on the political influences on research. As my faith in research was starting to wane, the world of academia was beginning to change. Most psychology research occurred in psychology departments funded by research grants. Government funding for research was drying up, so many psychology departments and researchers needed to begin looking to other sources. In psychology, one of the places more than happy to provide funding for research was the pharmaceutical companies, who needed research on their new medications. For many researchers, this was career salvation. At the same time, the tenure system was coming under fire and academic jobs were becoming more competitive. In reviewing the job advertisements, it was increasingly common to see universities requiring a successful record of research publications and grant writing in order to be considered for a job. Universities were also pressuring faculty to publish in “top tier” journals, which generally means mainstream journals. These journals quite often publish on topics that are popular, within the mainstream perspective, and, in essence, support or advance the status quo perspectives. To try to do anything innovative or outside of the mainstream, or to offer risky interpretations, was not as likely to get one published, especially in a top tier journal. The pressure to find significant results in research had never been higher. To publish, one needs significant results. As more of the funding was coming from pharmaceutical companies, it was increasingly likely that that researchers would worry that if they did not find results supporting the efficacy and low risk of medications, they would not continue to be funded. Researchers needed to have findings that were easily digestible by mainstream psychology to successfully navigate the peer review process. Researchers felt increasing pressure not only to find significant results, but also particular significant results. While this was particularly true in regard to research on medications, this was an increasing reality throughout psychological research. I have regularly attended conferences throughout my career, many of which featured a heavy dose of research. Over time, I began to notice a pattern. Like many, I was taught in my psychology research classes that research does not prove anything—it either provides support or does not support. Therefore, I was taught to be careful in writing up my results to not use the word “prove” or to suggest that my results have uncovered any definitive facts. Rather, I should use language that my results support or do not support a hypothesis. As I sat in these conferences, listening to research study after research study, I noted that most of these researchers were trained well in this regard. They did not start off claiming any facts. Yet, this often quickly changed when their research was challenged by someone in the audience. All of a sudden their research “proved,” “discovered,” and “demonstrated” much in the factual realm. Shortly after September 11, 2001, I was asked to do a television interview on a local TV station about the results of some research I conducted with a colleague on the psychological and spiritual impact of the terrorist attacks on individuals in the United States. It was evident to me that the interviewer was trying to lure me into using more definitive and factual language, but I did my best to avoid this. I had some success, but in my first of such interviews I was only moderately successful. I learned from this and before future interviews I would be clear upfront that I did not want them to try to edit my interview in such a way as to suggest I was saying things more definitively than I intended. This was not very effective and, instead, I stopped watching and reading any interviews. This helped me be more empathetic with another trend I noticed. I listened to TV and radio interviews of people who I heard present at conferences on several occasions. It seemed consistent that they were more confident of their results on TV. I began to joke that the TV camera adds ten degrees of confidence to one’s research or the size of one’s ego. Once again, I learned to be more aware of how often research is misused. The news media and their audience often are more interested in facts than theories. Thus, I have learned that it is always important to be cautious with research that is presented in the media. It is often distorted. Instead, I do my best to go to the actual article and read the research first hand if it is of interest to me. Yet, this provides another example of how research is often misused and why we need to be cautious when hearing appeals to the research. Reading these two articles on my loss of faith in research, it could be concluded that I am anti-science and anti-research. However, this would be inaccurate. I remain a strong believer in the value of research as a way of knowing, but I believe we use research more responsibly when we are aware of the limitations and the realities that often distort research. It is important that we are critical consumers of research and balance research knowledge with other ways of knowing. Blind faith in science and research is always danger. Over time, I have been much more drawn to qualitative research for many reasons. In particular, qualitative research fits better with my interest in the individual stories of people, has greater respect for individual differences, and allows us to gain a deeper perspective on the topics it studies. I also tend to see qualitative research as being more humble about its findings. However, I do not think of qualitative research as superior to quantitative or quantitative as superior to qualitative research. Both are important and both have their place. In fact, I think we get a much better understanding of a topic when we use both qualitative and quantitative research to investigate it. Most of all, in order to be a responsible consumer of research, as well as a responsible researcher, we need humility. We must recognize that whatever we find in our research, it is just one small piece of the puzzle that we need to consider in the light of many other forms of knowledge. In the end, it is my loss of faith in research that gives me greater confidence that I am able to use research responsibly.